What’s up with that kid on the bucket? Our Clowns without Borders show ends as it begins, with music. Music provides a safe mode through which we catalyze an initial connection with our audience and then later facilitate a smooth exit. The last two days we were invited to perform at two different homes for children who had lost their parents or caretakers to Ebola. The children we performed for eagerly joined us on “stage” to participate in our magic tricks, to pull the metal bucket off of my foot after I had accidentally stepped into it and had not been able to kick it off, to attack Apple’s bubbles with unkept joy, and to dance with us at the end, each taking turns to stand atop our metal bucket and show the rest of the crowd their dance moves, their strength. We end our show with a dance party for two reasons. One is that our work is about the child, for the child and we believe the child’s place is center-stage. The second reason, I will address in a few minutes. Before I do I need to share a challenge we have faced in these two homes and many others, in other countries, too. After the dance parties ended and we had a chance to change out of our sweat soaked costumes, on both days we met with a leader from each of the two homes. As if scripted, each individual called a child, then two, then three by name with a harsh tone. The children were singled out as “strangers” in their own homes. Upon being called, they walked over to their elder, eyes turned downward and with humility–this was quite the contrast from how they were dancing and playing just minutes earlier. This child had lost both parents to Ebola, this child was homeless because her family was evicted, this child was born with a deformity and left to live on the streets until he was rescued by our children’s home. The stories were heartbreaking; they also felt rehearsed. The children about whom the leaders were speaking listened to, once again, the story of why they were rejected. During our time at the second children’s home I heard the story about the young boy born with a deformed arm and back a second time after the head of the home told me about how they needed more funds. It is a travesty that children are introduced to foreigners by someone else telling the story of their suffering. It is unconscionable that a child be forced to hear, again and again, their story of rejection any time a foreign visitor, NGO or potential donor visits. It is not a travesty to ask for money, it is not unconscionable to assume that a person from a resource wealthy nation may feel moved to donate and support an important cause, but it should be done in a way that does not risk stirring a child’s own trauma. But sadly, this is nothing new. Television commercials in the mid 1980’s that played Pachelbel’s Canon while flashing photos of malnourished children looking miserable, the comedian, Jack Black, just a couple of years ago weeping while he visited children living in Uganda for the U.S.version of “Red Nose Day–the manipulation of suffering as a pitch for donations, we’ve all seen it before. But what if it was your child singled out by some foreign film crew and recorded at his very worst? What if your most wretched moment was caught on tape (without your permission) and then used to raise millions of dollars? So what if we could change that narrative? What if we could tell the story of a child or family’s hardships without risking exacerbating their PTSD? What if we could raise funds, awareness and advocacy for people in need without framing them by only their suffering? And now back to my second point as to why we end our shows with a dance party. I’ll also answer why there is a child standing on a bucket. We bring a child on stage with us as our shows end and we start a copy-cat routine. It begins with the child copying silly dance moves and then the bit moves towards them flexing their arms like an Olympic champion. (Think Michael Phelps, but shorter.) The child, depending on how comfortable they are in the moment, then stands on my shoulders to flex or they choose to stand on the bucket, elevated above the crowd. Some children roar like lions when they are standing there. During our last two shows, children lined up during the final dance party so that they could take their turns standing resolutely on the bucket. We do not choose to highlight children because of their perceived deformities or weaknesses. We select children from the audience who seem engaged in the clown foolishness in front of them. When they join us on our makeshift stage, they always win and their strength shines through. This we call resilience. It is resilience through playfulness; it is resilience through laughter. In our short two-weeks here we have witnessed and heard of extreme hardships. The children we have met have gone through indescribable challenges; most of them continue to face these challenges head on, because they have to. In no way do I want to make their hardships seem unimportant and I do so strongly believe that children’s homes like the ones where we worked need support, yet the image I hope to leave you with is one of resilience despite all else: a child standing proudly on an overturned metal bucket, flexing her arms and the audience cheering for her, for who she is and what she will become. 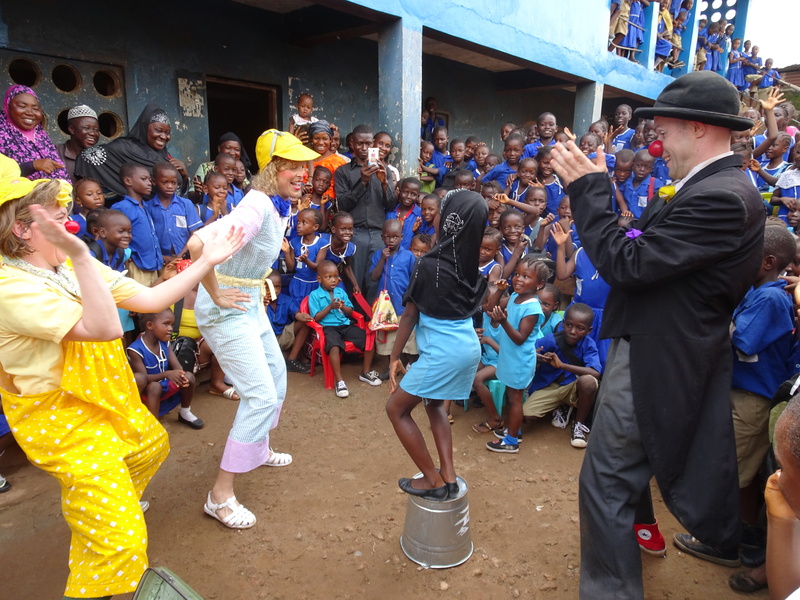 Learn more about the work of Clowns Without Borders.